I'm always saying that one of the best things about owning a wooden boat is you get to meet lots of people who row over to take a look and ask questions. This phenomenon works in reverse too. 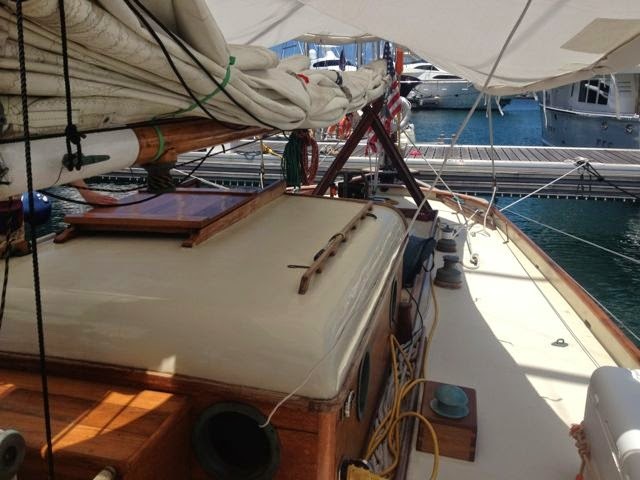 Yesterday, a beautiful wooden schooner named Mistress sailed into the marina. 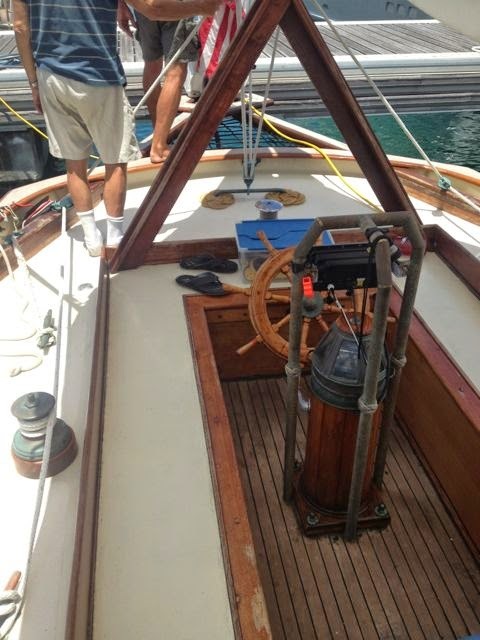 The Antigua Classic Yacht race is next week (April 17-22) and clearly this beauty was on her way to the match. As soon as I saw her, I knew we had to pay her a call and maybe even get a tour. So at our earliest opportunity, Helena and I strolled down the dock to say hello. 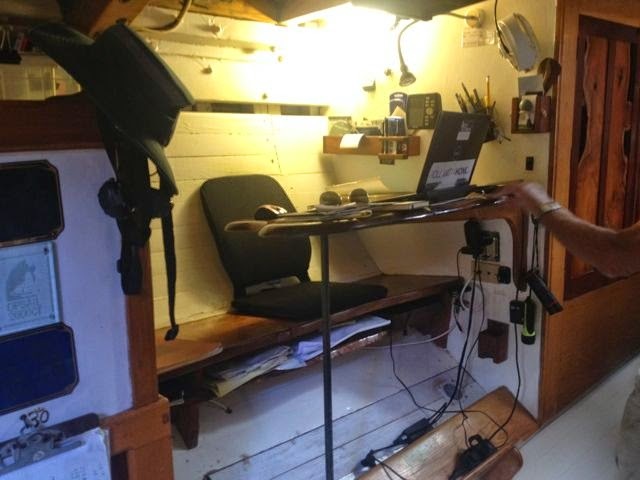 Now, you might think this was a bit bold of us, but if most wooden boat owners are anything like me, the one thing they like is showing off all their hard work. If, in addition, you seem to know which end of a varnish brush goes where, so much the easier. So we had soon introduced ourselves to Baily, one of the crew, and were joined on the dock by Julie, the wife of Mistress's owner. Glen, the captain, was doing what all captains do when entering a new port -- paperwork -- but they would be happy to give us a tour tomorrow (i.e., today.) We invited them over cocktail hour at 5, and at 5 on the nose, Baily showed up and soon had a Fiona cocktail in his hand. Baily -- a very experienced sailor -- traded war stories with Eric, and more importantly for us, confirmed our invitation for the next day. Of course, Eric had a list of chores that must be done before departure, but the were soon dispatched and around mid-day, we paid Mistress a call. She was designed by C. Sherman Hoyt, "master helmsman, tactician, designer, raconteur... legendary during the Golden Age of large sailing yachts" (and, incidentally, grew up in the next harbor down from us, in Oyster Bay, NY) and built in 1930 for George Roosevelt, nephew of Theodore Roosevelt, who also lived in Oyster Bay. She raced through the Depression and war years, spent some time as a training vessel at the Maritime College on Long Island Sound, then did some chartering in the Caribbean. In 1987, she was bought by Glen and his brother, and rebuilt from stem to stern. Eric isn't a fan of varnish (it does get thick in the can, when you are in the arctic! ), but Helena and I are (I often wonder why everything isn't varnished???) and there is no end to Mistress's brightwork. Pictures just don't do it justice. Confirming her pedigree as an ocean racer, her cockpit was relatively small, but of course sea worthy. 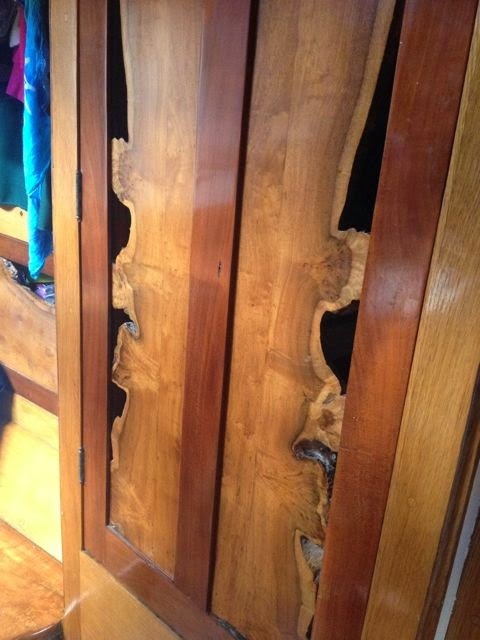 Eric was surprised to discover that Mistress's two glass-smooth masts were not metal, but wood. One solid, the other hollow. I wish I'd had time to photograph in detail all the amazing original hardware and fittings that now pop out at me when I look at these photos, but to be honest, I was too bedazzled at the time to take it all in. I am an utter fan of open, clear decks, and Mistress is my new ideal. It must be a joy to work on. As amazing as she is above decks, Mistress real shines below deck. Glen and his brother gutted the interior, and had it redesigned by Key West artist Jimmy Wray. She's nothing like any other boat I've seen. Most striking is the large galley, which faces an island not shown in the photo below. 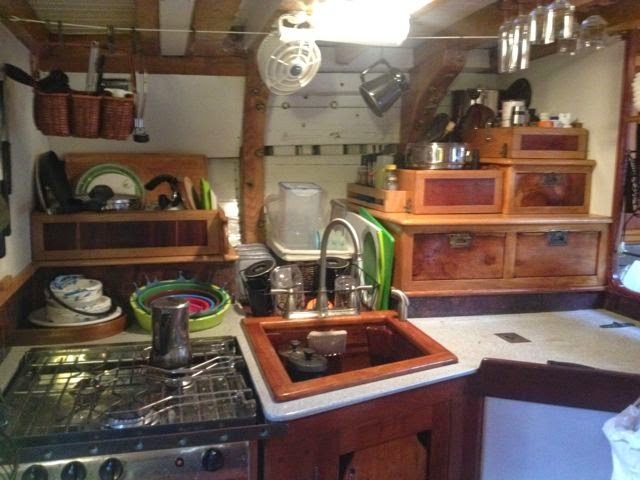 The cook can wedge herself in between the galley and island and cook without being thrown about. The island also keeps other crew members out of the way, which must be very convenient. The library/dinette is equally amazing. Big enough to seat 6 comfortably, and 8 in a pinch, it looks inviting and comfortable -- not usually true for yacht dinettes! The photo below gives you a feel for the size of Mistress below decks. I was not even all the way forward when I took this photo. To the right is a guest cabin and large head. To the right are several comfortable looking sea berths, plus lots of storage. 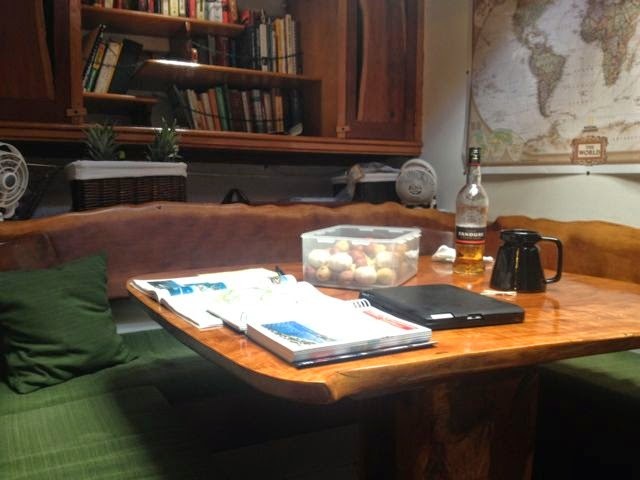 Really unique is the office/nav station, perched right across from the galley. Throughout the cabin, ventilation is supplied by using live-edged boards for door panels, like the one's shown below. Not only are they beautiful and strong, they allow plenty of air circulation. Helena and I immediately offered our services as crew, if Mistress is ever in the Long Island/New England area. I hope Glen and Julie take us up on our offer, someday! I can varnish, too, Glen! Last night it rained again, and once again I was woken with wet feet. I groggily left my bunk to close the hatch over my feet, and bring to in some towels that were hanging to dry in the cockpit. The wind was roaring and to my surprise, one to the ropes used to tie the tarp down was loose. The line was flogging and cracking, and the tarp, dangerously loose on one end, was about to snap the other lines that were barely holding it. With every gust of wind, the canvas would inflate and try to fly loose of its ties. I considered an attempt to tie the canvas down, but since I can only do the “shoe lace knot” there was only one alternative -- Joooooohhhn!! I startled him, I think. He came out running, wearing his reading glasses (the urgency of my call didn’t allow time for searching the other pair). He swiftly tied the loose line, checked the other ones for safety, and calmly went back to bed. Love those sailors. And, despite the night's drama, we haven’t left the dock yet. 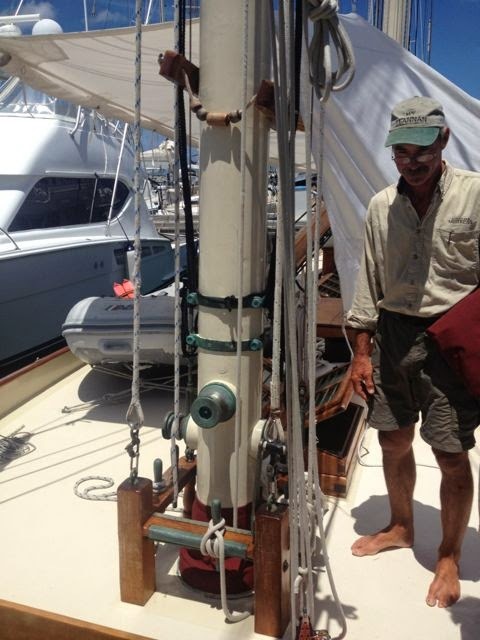 Wrist bands on, John took Dramamine as he always does for the first day's sailing offshore. For a change, I took a homeopathic remedy, which turned out to be a big, big mistake. We motored out of the marina at about 4pm. Ninety miles to Virgin Gorda, 17 hours to go. The wind was not too strong, but the waves rolled the boat quite a bit. Nevertheless, it was soon time to put the sails up. Captain Eric gave strong orders and John was up and down, port and starboard, rigging, pulling and hanging on -- really hanging on. 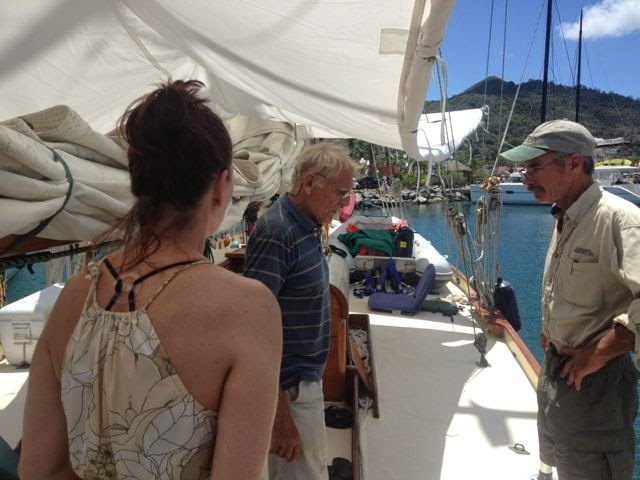 One of the lines that goes through the sail (the reefing line?) became undone, and we were about to lose it. John bravely reached for it (body over the railing, gulp) and saved the day, again. But now it is happy hour. Forget that! I am soooo queazy, I don’t even have wine with my chicken sandwich. Going down to the cabin? I don’t think about it. Use the head? Forget it. With a smile, John suggests I take some of “real” meds for motion sickness. Fine. Be that way. The advice didn’t make me feel much better. But in a couple of long hours, the Dramamine did. While wailing for the meds to take effect, I am looking around and instead of seeing a beautiful moon, sapphire colored water, short rolling waves, all I can think of is why? Why are we doing this again? Now I remember the drama, the uneasy feelings, the stress. I am on the first watch, 8 to 10. Good luck for the people that have their lives in my hands. But then the next watch 2 to 4 is better. I am more awake and ready to blog. I am so impressed that Helena is once again on the high seas. Wouldn't have guessed!